I’d blogged the other day about the shortest Kindle sample ever. But I’d forgotten about a funny experience I’d had when I first bought my Kindle. I hadn’t seen any illustrations on my Kindle yet – except for the screensaver images that kept surprising me every time I put down my Kindle for too long. So I’d searched for a collection of Kindle comic strips, and eventually found one of the all-time classics! 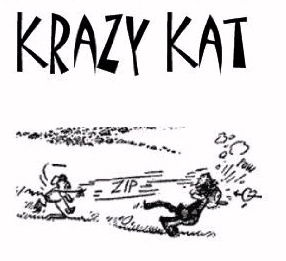 Krazy Kat is a strange and surreal slapstick comic strip that first appeared in 1913 – and I’ve always loved it. It’s a simple, sweet world where the cat loves the mouse, and ordering a sample seemed like the perfect way to test out the Kindle’s graphics capabilities. So imagine my surprise when I’d downloaded the sample to my Kindle, and discovered…nothing. Followed by this sentence. Enjoyed the sample? Buy Now or See details for this book in the Kindle Store. Now that’s surrealism – a zen-like sample filled with emptiness and arbitrariness. (I felt like I’d just been clobbered with a brick!) Or was it just another surreal landscape drawn by George Herriman in which everything had disappeared? So I finally purchased An Anthology of Krazy Kat Komics. And though it’s short, and I have to enlarge the images just to read them, I’ll always have a special affection for this ebook, because it included the first illustrations that I ever saw on my Kindle. And also because they’d sent me the strangest Kindle sample ever.